That’s how Brian Jones begins his new book, Second Guessing God: Hanging On When You Can’t See His Plan. If you’re looking for a book that helps you deal with the unexpected, the tragic, the uncertainty of life, Brian has written a book for you. Within each major section, chapters deal with subjects like Power, Compassion, Doubt, Mystery, Church, Ministry, and Heaven, plus several others. The book reads like a tour through the reality show we call life. Writing with a pastor’s heart, Brian tells both funny stories (like the french-kissing gay couple that kept visiting his church); and poignant ones, like the death of his cousin, Craig. Brian weaves scripture, real life examples, and an evangelical perspective into a book that is more than the usual “it’s God’s will” explanation for the difficult moments of life. Second Guessing God would make a great small group resource, and I was delighted to discover there is a separate discussion guide available. But, whether you get the discussion guide or not, the book is so full of scripture, stories, examples, quotes, and illustrations that you won’t have any trouble using it in a small group setting as is. 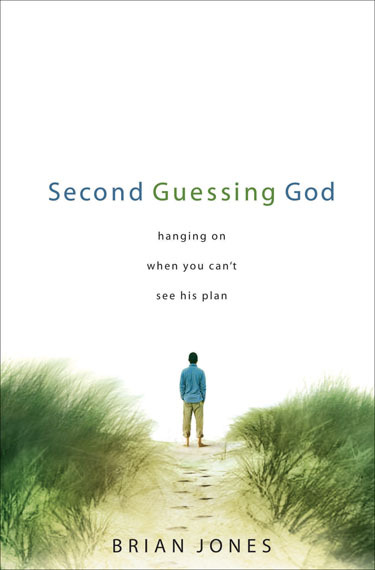 Published by Standard Publishing, Second Guessing God is available at a discount at www.standardpub.com/sgg/. Brian is donating all the proceeds (he’s a better man than I am!) from the book, and I think he wrote it to really be helpful to folks who are struggling — including pastors who experience their own faith crises but have few resources to turn to. Let me know when you get the book and what you think. The author, Brian Jones, is the founding pastor of Christ’s Church of the Valley in the Philadelphia area, an innovative faith community whose website is www.moviechurch.com. Check out their site, and check out Brian’s at www.brianjones.com.